Flywheel timing pin – No.303-698. Remove crankshaft position (CKP) sensor. NOTE: Engine at 50° before TDC on No.1 cylinder. Ensure timing mark on each camshaft sprocket aligned at 12 o’clock position  &  . Insert 6 mm drill bits into camshaft sprockets  . Slacken bolts of each camshaft sprocket and high-pressure fuel pump sprocket bolts  &  . Remove tensioner rail, chain guides and timing chain. Ensure flywheel timing pin inserted  . Align copper coloured chain links with timing mark on each sprocket  ,  &  . 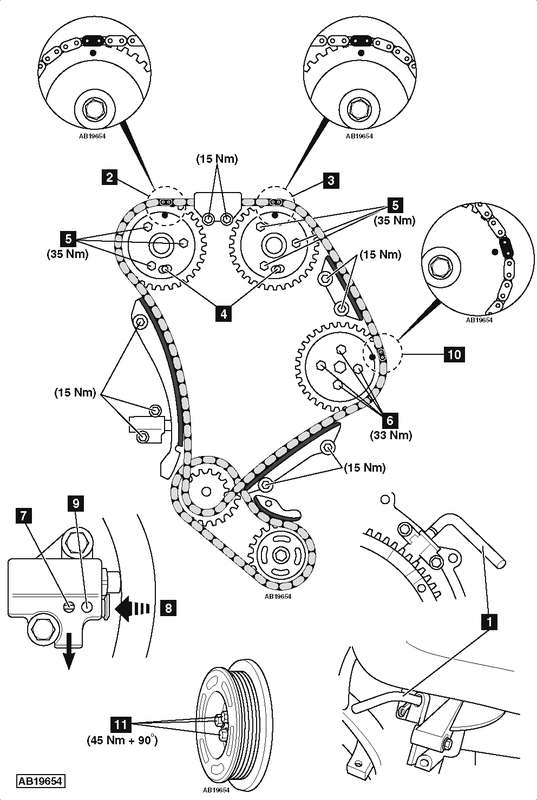 Ensure timing chain is taut between sprockets on non-tensioned side. Remove pin from tensioner  . Tighten bolts of each camshaft sprocket  . Tightening torque: 35 Nm. Tighten high-pressure fuel pump sprocket bolts  . Tightening torque: 33 Nm. Remove 6 mm drill bits  . Ensure 6 mm drill bits can be fitted  . If not, repeat timing chain installation. Tighten crankshaft pulley bolts  . Tightening torque: 45 Nm + 90°. NOTE: Crankshaft pulley bolts MUST only be used once.